Fred Buyle and William Winram arrived in Papeete (Tahiti Island) shortly before 5am. After another wait for the ferry, they finally arrived in Moorea (17°29’31″S – 149°50’08″W) later that morning. 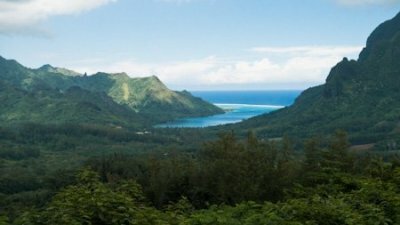 One of several of the Windward Islands of the Southern Pacific Ocean, Moorea was well worth the very long trip and all the hassles of traveling with a lot of diving gear: it is such a beautiful island. They are kindly hosted by the CRIOBE – Centre de Recherches Insulaires et Observatoire de l’Environnement. Let’s be fair. While they are not in Moorea on vacation, you will not hear them complain. That is because they are combining work and play. Indeed, the Ocean Quest series final filming starts tomorrow and it will document their participation to a shark research program run by Johann Mourier. 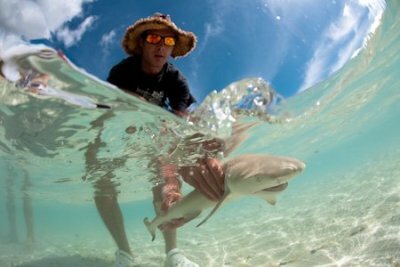 Johann is a PhD candidate from France who is studying the ecology, structure and organization of shark populations in French Polynesia. His research will help better understand insular shark populations in order to reveal their degree of vulnerability. This, in turn, will help the design of conservation strategies. Yes, don’t let the catchy title of this story mislead you. As you may have already read in other parts of this website, sharks need to be protected. “It is now accepted that large, long-lived marine animals such as sharks are declining rapidly due to overexploitation and habitat degradation. Global environmental changes and human activities such as tourism and fisheries affect more seriously species with high natural longevity and low reproductive rate. Because of a lack of information about the basic ecology of many shark species, we need to improve our knowledge of the behaviour, ecology and organisation of shark populations to help in designing conservation strategies and to improve public understanding and support for shark conservation. 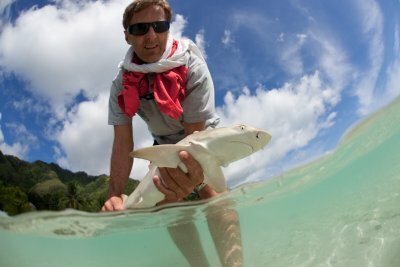 Due to the lack of scientific data about shark stocks and shark vulnerability, the precautionary principle was used to introduce the legislation to protect sharks in French Polynesia and to ban shark finning since the 12th April of 2006″. Johann does a tremendous amount of information-gathering via tagging and DNA-sampling of sharks. The DNA is taken after catching the sharks on rod and reel; the procedure is done quickly as the sharks are measured and the sample taken so they can quickly be returned to their normal activities. Fred and William’s initial dives are nice, even though they are jet-lagged. No more than 17 meters and already a lot of sharks, mostly blacktip reef sharks (Carcharhinus melanopterus) and lemon sharks (Negaprion acutidens). On one of the days, they accompanied Johann to what he calls the nursery – an area of the lagoon where the baby lemon sharks and blacktip reef sharks frequent. Fred and William helped him catch them, measure them and take a DNA sample. William says: “While diving with Johann, I am amazed at how well he knows his subjects. He can tell from a quick glance, whether he has already taken some genetic samples from a shark just by looking at the distinct markings on the dorsal fins. 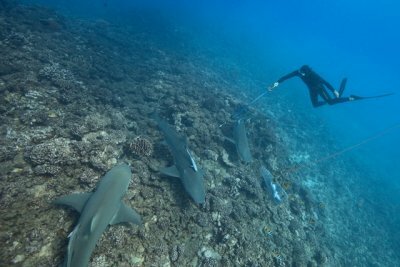 He has identified 300 different blacktip reef sharks and can tell you from memory if a shark is new or one that has already been sampled”. The work tagging has proven more challenging because the lemon shark has tougher skin than one might think and so requires a near perfect shot. The difficulty has been to document our work on film. It seems that often times the presence of the cameraman on scuba can upset the shark or cause it to turn unexpectedly. We discovered how tough their skin was when one of the darts did not penetrate properly and sat hanging out of the shark. Fortunately, the animal seemed unbothered by it and remained in the area so that we could dive on it and pull the tag free to later re-apply it. After the successful re-application of the tag, the animal left the area. William and Fred have had some good diving here and a good warm up for the tougher dives to come. On December 15, they head to Rangiroa where they are going to be attempting to tag the Great Hammerhead sharks (Sphyrna mokarran) – this means very deep dives and a very shy animal. William would like to than the people who work and study at CRIOBE as they have been very nice and helpful to William and Fred; it has been a real pleasure working with them.